Football is back in LA! The Rams moved to the city in the off season. The NFL was desperate for an LA team, and this is a big move. This LA team is intriguing, but will they surprise people and thrive in a tough division? Todd Gurley, Jared Goff, Aaron Donald and many other key players on this team could be deciding factors. Today, we go over what areas are doing well, which areas need work, and what to expect of the 2016 Rams. The Rams front seven is already loaded. Aaron Donald, Robert Quinn and Alec Ogletree headline the position and Mark Barron and Akeem Ayers are also major contributors. But one guy who I think has lacked attention in the past and may draw people in this season is defensive tackle Michael Brockers. The 2012 first round pick has quietly racked up 14.5 sacks in his 4 year career, but has never reached six in one season. Brockers has started for most of his career, but never really has broken out. He’s in a contract year, and if he wants an extension with the Rams badly enough, he’ll break through this season. I could see him with 8 or 9 sacks at the end of the season, and he will make a fierce Rams pass rush even better. They already picked up the fifth year option, so it looks like he has one more year to prove himself. Jared Goff did not look ready to start at minicamp, but he still has training camp. He will make or break this Rams team. His success is what will decide this team’s fate. I think if he can get comfortable with the Rams system, he will dominate and thrive. Will Goff perform well this season? It will be tough to thrive without any strong receiving weapons, but I think Jared Goff, the surprise No. 1 overall pick, is capable of doing so. Tavon Austin did finally break through last season, but somehow Kenny Britt is ahead of him on the depth chart? Kenny Britt is not a legitimate receiver, fantasy-wise or in real life, but Austin is a sleeper to be a legitimate weapon. Britt should not be the WR1. You may think the Rams now have no receiving weapons, but they have several underrated weapons, Tavon Austin, Lance Kendricks, Pharoh Cooper, Tyler Higbee, I could go on all day. But will they break through and do well enough for Jared Goff to start strong right off the bat? 1. Will a weakness at o-lineman affect the make or break offense? The offensive line, especially the interior offensive line, is LA’s major weakness. If they continue to have problems, it will make it tougher for Jared Goff to adjust, making it harder for the receivers who want to rack up some surprise yards. 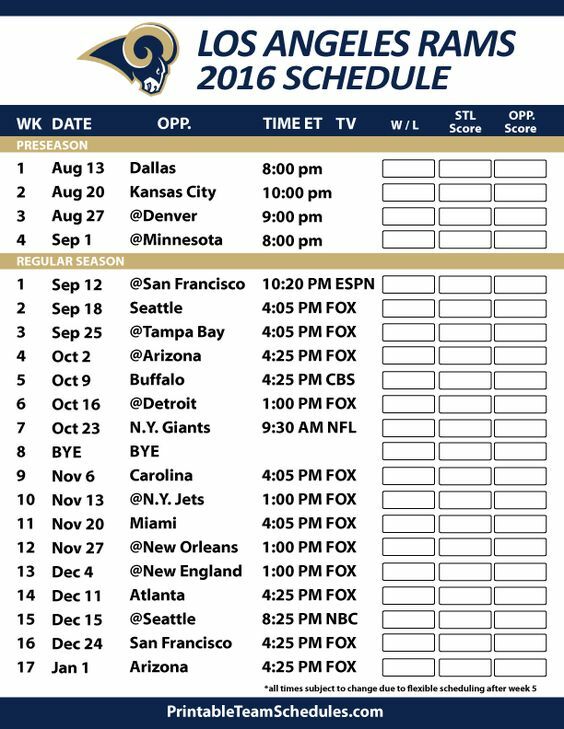 That offensive line better step it up, or it could ruin the Rams’ entire offensive scheme, and make defenses bull through to pressure Goff, Gurley and the receivers more easily. The offensive line is yet another unit with a make or break season ahead. 2. Will the secondary top off a powerful defense? The front seven is already a consistent source. But the Rams have holes in the secondary, and if they can get it together, the defense will be among the top. Trumaine Johnson has just one more year in LA, so they need to not just find more talent for this year, but extra for the future. T.J. McDonald could be a source, but the 2013 3rd rounder has not yet broken through. They have some names at corner, Coty Sensabaugh got 2 picks last year with Tennessee, E.J. Gaines also got two picks in 2014 after missing the entire 2015 season. But the Rams still have a serious hole at free safety, and that could bring down their defense, especially when they’re still trying to find guys at corner and strong safety. This entire secondary needs to get it together, and if it can, this defense will add to an already strong defensive division. 3. Which sleepers will break through, and which will be duds? The Rams have a lot of sleepers on offense, and with the defense already doing its thing, and well, their performance could make or break the team. Will Tavon Austin continue to get better? I don’t know, I can’t really see him doing much more than he did for the team last year, but you never know. I think Kenny Britt has already proved that he can’t be much of a help, but he must currently be WR1 for a reason. He was a 1st rounder in 2009, and he does have 25 career TDs, but is the Rams the right fit for him? He’s not puting up the same numbers he did, and he’s either a bad fit, or is getting old. I can’t see Brian Quick doing much either. He’s in a downward direction as well, but Pharoh Cooper has a lot of upside and was a good draft pick, along with Mike Thomas. But I think the Rams have the most hidden potential at tight end. Lance Kendricks could become a big name with experience and consistency. Tyler Higbee may pay off after being drafted. I see several tight ends making a splash in 2016, not just in LA, but all over the league. There are more potential Gronks out there. It’s a tough position to be in, but there are opportunities to shine. This may come as a surprise to you. Most of the older running backs are on a major decline or already retired. But the younger generation of running backs is out to dominate. Le’ Veon Bell could be on pace for some serious numbers if he stays healthy and out of trouble. I also like Todd Gurley to dominate again. Ezekiel Elliott and David Johnson could stack up some big numbers as well. A couple older RBs are also still getting into greatness. I think Adrian Peterson and LeSean McCoy will have big years too, Peterson is still unstoppable, and McCoy should probably adjust to the Bills system this year. He was good last year, but got hurt and was a little less dominant than usual. I think he’ll bounce back. Eddie Lacy could even surpass 1400 yards this year. I think Gurley, along with Peterson, McCoy and Le’ Veon Bell will top 1400 yards this year. The NFL does have more strong wde receivers, but they do have some explosive RBs as well, even in a receiver friendly year. The Rams do already have a strong pass rush, but in a tough defensive division, they have competition. Even the 49ers have a better defense than offense. But I think that the Rams have a better pass rush than you might think, and this year, Aaron Donald, Robert Quinn, Alec Ogletree, Mark Barron, Michael Brockers and Akeem Ayers, will all band. together, with full power and strength, and hoard a ton of sacks. More than the Seahawks or Cardinals put up, and they won’t just lead the division. They’ll lead it by far, and maybe even take a spot in the NFC’s top 3. That’s just my opinion. But can the offense stay consistent, and make a dependable playoff contender of the Rams? The Rams have plenty of big sleepers, but I have the most faith in tight end Lance Kendricks. Kendricks has shown some pretty great things, but now in a starting role, he needs to show more consistency. I think Kendricks is capable of scoring 10 TDs if he gets reps. Whether or not this team functions or wins games, this guy will be a breakout candidate. I think the offensive line will make it a lot harder for this offense to thrive, but I still see a lot of potential in Kendricks. The LA Rams are in a good spot, but holes around the offense could cause them to fall apart of inconsistency, especially with a weak offensive line, which is never good and just makes things harder for them. They open the season in San Francisco. I think this defense will be one of many to overwhelm the Rams, and they will drop this game on the road. I think the Seahawks defense will also do extremely well against the Rams. The Rams will not top them, even at home. The tough schedule just goes on after that. A young Buccaneers team with a revamped defense should be too strong for the Rams in Tampa Bay, the Cardinals will present another, unbeatable, tough defense, especially on the road, and don’t sleep on the Bills. Injuries and all, with the draft they had, a revamped defense of their own should edge out the Rams. Even with bad defense, in Detroit, this underrated Lions team will beat a Rams team who’s offense just cannot find the missing puzzle piece. Trust me, it will happen, but the start of the season will be a rough ride. The Giants revamped front seven should top the Rams as well, even in London, a neutral location that the Rams have had a lot of games in. Yes, at the bye, they will be win-less. The Panthers defense should be another tough one that pressures Jared Goff and the o-line, another loss for them. In New York, I don’t think they can catch the Jets, who have a strong defense as well. But then comes a game at home against the Dolphins. By this point, Jared Goff will have gotten way more comfortable and will be fed up with losing the first 9 games. The Rams should edge an aging and weakening Dolphins defense, overwhelm the offense, and take the easy W. The Saints offense should then take advantage of the Rams weak secondary, especially at home. Bill Belichick and the Pats should find the next week easy. But then they come home to host the Falcons. The same Falcons who have their own inconsistency on offense and defense. The Rams will again crush them, as they look like the kind of team who will dominate when they have the right formula. Then, in the last three weeks, Seattle and Arizona are unbeatable, but they will top the 49ers on their home turf. The Rams are actually better than San Francisco. The Rams are the kind of team that typically struggles, but when they do well, they dominate. They have the pieces on offense and defense, they just need to put them together. I see 3, 4 maybe even 5 wins if they’re lucky, but a tough schedule makes things 2 times harder.